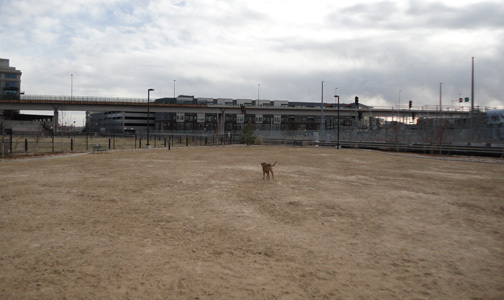 The Railyard Dog Park opened last September giving the residents of Riverfront and LoDo a wonderful place to let their dogs run and play off-leash. Unfortunately, the surface was made up of a bunch of gravel and rocks that were pretty hard of the feet of our four legged friends. The dog park is run by Denver Parks and Rec and just last week they came and put a new surface down. It’s now more sand than rock and I’m happy to say that the dogs and their owners are much happier. I stopped by to check it out and found many dogs happily running and playing in the park. If you’re dog didn’t like the old surface of the park, be sure to give it another try!